Only UVB and UVA rays ever reach the earth’s surface and therefore your skin. UVA rays penetrate more deeply into your skin and are primarily responsible for photoaging and tanning, whereas UVB rays don’t penetrate as deeply, have higher energy, and are responsible for sunburns. An easy way to understand the difference between UVA and UVB is to relate UVA to “light” and UVB to “heat”. Look at the graph above. Notice that UVA is fairly constant throughout daylight hours, whereas UVB gathers intensity with the warmth of the sun, peaking at mid-day, and declines again. 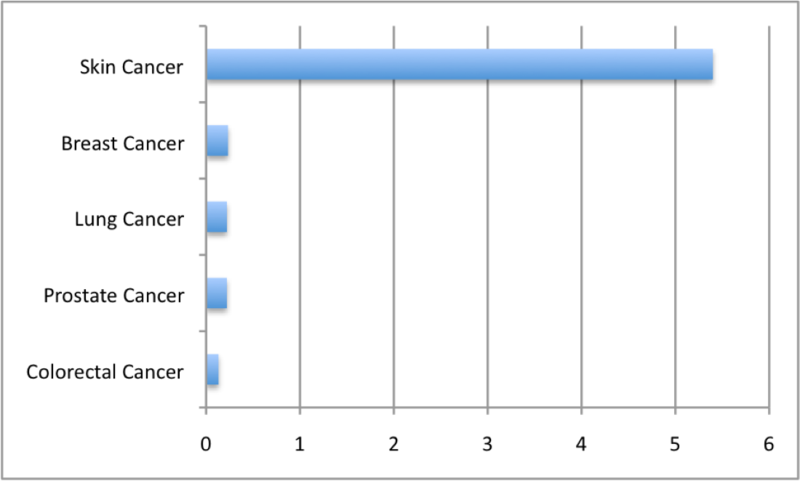 Skin Cancer Is More Prevalent Than All Other Forms of Cancer Combined! Your risk of getting skin cancer is directly tied to your UVA and UVB exposure. Not only are skin cancer rates on the rise, but skin cancer is more prevalent that all other cancers combined! Basal cell carcinoma (BCC), squamous cell carcinoma (SCC), and melanoma account for more than 99% of all skin cancers. BCC and SCC are related to cumulative, long-term sun exposure, while SCC and melanomas are related to intense sun exposure that typically results in sunburn. BCC and SCC are by far the most common skin cancers and if diagnosed early are easily treated and rarely become life threatening. Melanomas, however, can be deadly if not diagnosed and treated early, killing an estimated 10,000 people in the U.S. annually. In fact, more than four sunburns at any age more than doubles your risk of getting melanoma. 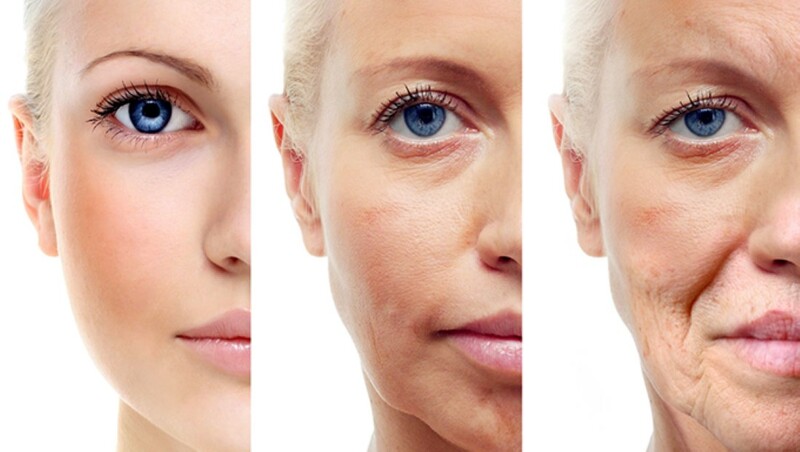 Up to 90% of age-related changes you see in your skin are caused by UVA radiation. While UVB rays are absorbed in the epidermis, UVA penetrates deep into the dermis and damages the collagen, elastin and other fibers that give skin its structure and a smooth, youthful appearance. UVA also reduces your skin’s ability to repair itself and eventually will result in wrinkles, dark spots and sagging leathery skin. The best protection against photoaging (aside from staying out of the sun altogether) is to use and reapply a true (see below) broad spectrum sunscreen. 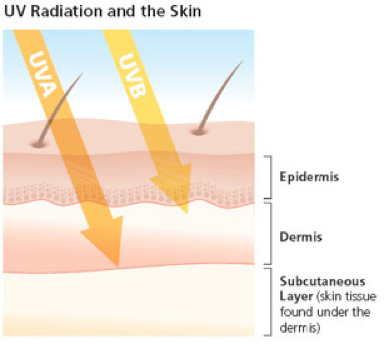 The UVA spectrum is broken down into UVA1 (340nm – 400nm) and UVA2 (320nm – 340nm). While the entire UVA spectrum causes photodamage (and increases your risk of skin cancer) UVA1 is responsible for 75% of all the photodamage to your skin. If your “broad spectrum” sunscreen doesn’t contain either zinc oxide or avobenzone, then you are not protected from the most photoaging part of the UVA spectrum. 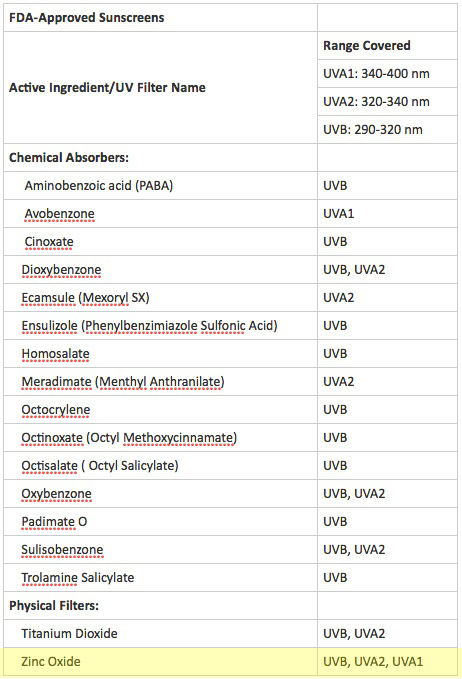 SunFly will be developing indicator inks that can distinguish between UVB, UVA1 and UVA2 to help you know if you sunscreen is truly broad spectrum, and of course, when to reapply.